What Causes High Levels of Potassium in the Body? Hyperkalemia is the term given to high potassium levels circulating in the blood system of the body. Potassium is a necessary electrolyte used for the proper function of metabolism, heart rate, regulation of muscle tissue and digestion. While potassium is necessary, high levels of it has many side effects that can lead to several life-threatening conditions, including heart failure and renal failure. Root causes of hyperkalemia can stem from either diet or malfunctioning cell excretion of the electrolyte. 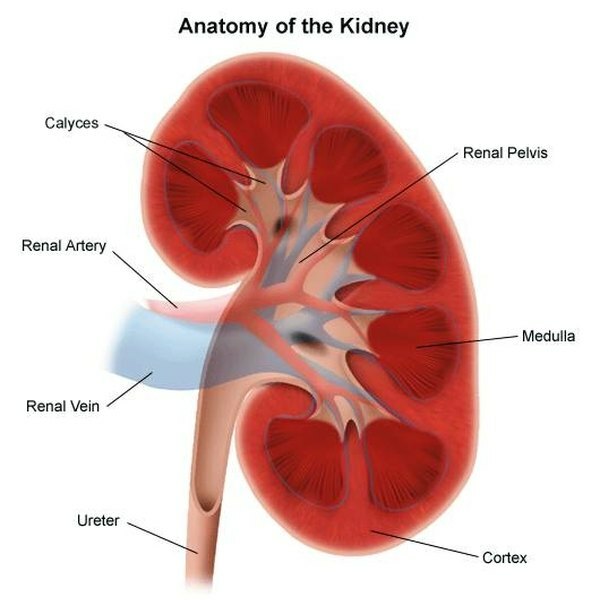 The kidneys are responsible for keeping homeostasis for levels of potassium as well as other electrolytes. High potassium levels may signal kidney failure, including kidney disease, glomerulonephritis, acute or chronic renal failure, lupus nephritis or obstructive uropathy. Other causes can be from low levels of aldosterone, a hormone used in regulation of potassium levels. Some patients with mild increases in potassium in the blood will feel no signs of any symptoms. The most common symptom of hyperkalemia is an irregular heart rate. Arrhythmias are common in hyperkalemia since potassium is one of the major ions used in action potentials in the heart muscle tissue. Patients may also have other symptoms, including nausea, vomiting or fatigue. A hyperkalemic patient may also have a slow and barely detectable pulse. Patients with hyperkalemia can go into cardiac arrest at any time. Hyperkalemia treatment is dependent on the condition of the patient. Short-term treatment for acute cases includes dialysis and diuretics. Calcium is used to combat the abnormal heart rate, and sodium bicarbonate is a potent buffer normally found in the body to keep pH levels at neutral. Sodium bicarbonate is used to treat acidosis caused by increased potassium levels in the blood due to kidney failure. Long-term treatment focuses on lifestyle changes in the diet. Lowering potassium intake is the most important change that will reverse the prolonged effects of hyperkalemia. Since hyperkalemia is often a sign of chronic renal failure, loop diuretics are given to patients to help control the potassium levels and fluid retention. Because hyperkalemia mostly affects heart rate, several tests are done to monitor heart health. ECGs are used to watch for potentially fatal arrhythmias. ECGs are also necessary to observe any prolonged bradycardia (slow heart rate) and ventricular fibrillation. Doctors will also take tests that monitor any high levels of serum potassium to detect progressive chronic kidney failure.